Dr. Balogh was elected Judge of the Constitutional Court by Parliament in November 2005. He graduated from the Faculty of Law of József Attila University, Szeged, in 1983; two years later he qualified as a legal adviser. After his studies at the University of Freiburg, in the period of 1989-1991, he was awarded the title of “doctor iuris” at the same university, in 1992. As an Alexander von Humboldt Foundation research fellow, he spent the academic year of 1998/1999 at the Leopold Wenger Institute, Munich. He qualified as a university lecturer in 2001; he was granted full professorship in 2002. 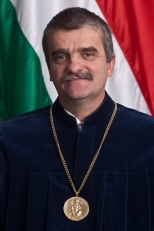 At the moment he is teaching European constitutional and legal history, as well as Hungarian criminal law history at the József Attila University, Szeged. In addition, his research fields include the Hungarian and European canonical jurisdiction and copyright history, too.